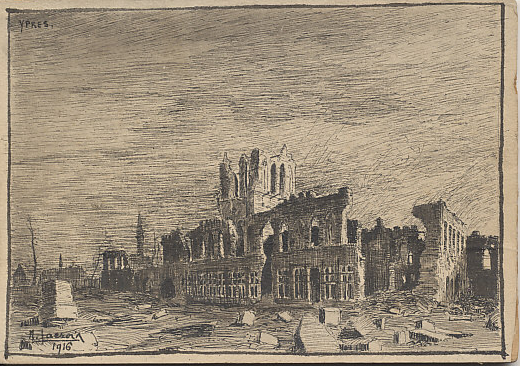 Pen and ink sketch of the Ypres Cloth Hall dated 1916 by N. Faeror? Faeroir? On November 22, 1914, German forces shelled the Hall and St. Peter's Cathedral with incendiary shells. In his memoirs, French General Ferdinand Foch, wrote that they did so to compensate themselves for their defeat in the Battle of Flanders.